The latest entry in the Monster Hunter series, Monster Hunter: World, introduced a bunch of powerful new monsters for players to fight. After defeating or capturing these monsters, players can carve parts off of these powerful beasts to make better weapons and armor. Armor sets can be crucial against certain monsters, as they provide huge elemental defensive properties and abilities that can keep you alive in a fight. Some armor sets, however, are stronger than others. You can mix and match armor pieces from different sets, but using a full set of armor offers unique abilities that otherwise can't be unlocked. These traits and abilities can sometimes be vital to surviving a tough fight or help you grind items for more powerful armor and weapons. 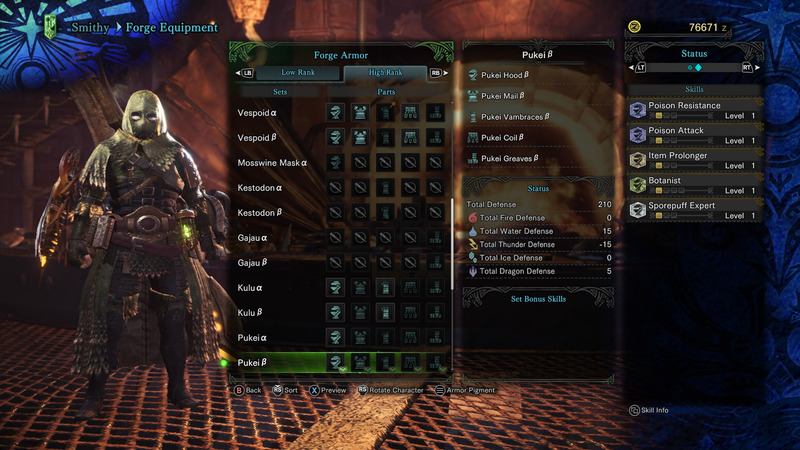 Jagras is the ideal first armor set to collect when starting the game. It has few weaknesses across the board against multiple creatures, but it'll keep you alive longer than the starting armor ever could. Slaying the Great Jagras is easy and the armor can be made after a couple of fights, giving you enough time to get used to the game's controls and find the playstyle that best suits you. Another great starting armor set is bone, just because of how easy it is to create and how many resistances it has. You could technically use this armor set for the entirety of low rank quests if you were skilled enough—that is how good it is. It also has no weaknesses and makes it ideal for tackling some of the first bosses so long as you upgrade the armor with armor spheres. Just don't get too attached to it, its an early game armor at best. 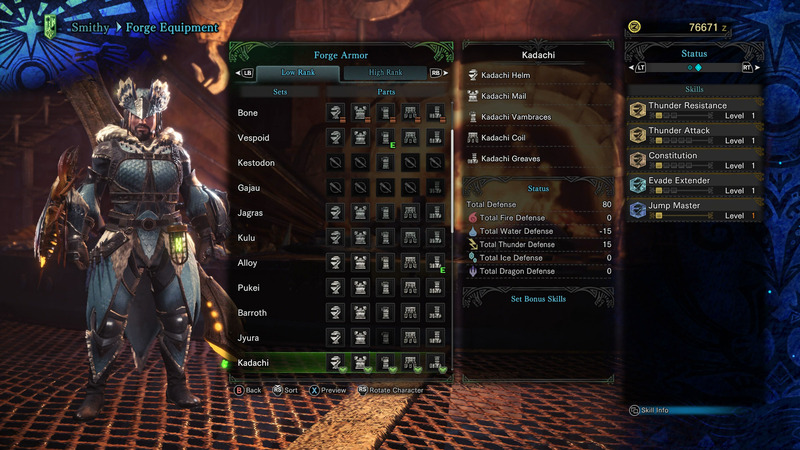 The Kadachi armor set can get you through the later portions of the game. It's only major weakness is against water-type enemies, which hardly appear in the game. The only monster that would cause you any grief is the Jyuratodus at Wildspire Wastes, so don't fight against that beast with this armor. The +15 defense against lightning enemies might also help you when going up against a Kirin. Legiana's armor might not look that great at first glance, but it has one of the best abilities in the game—Good Luck. This ability increases your chance of earning better quest rewards. So when you get closer to High Rank and want a Rathalos Plate item, for example, you'll have a slightly better chance of getting it when you wear this armor. High Rank breaks armor into two different sets. 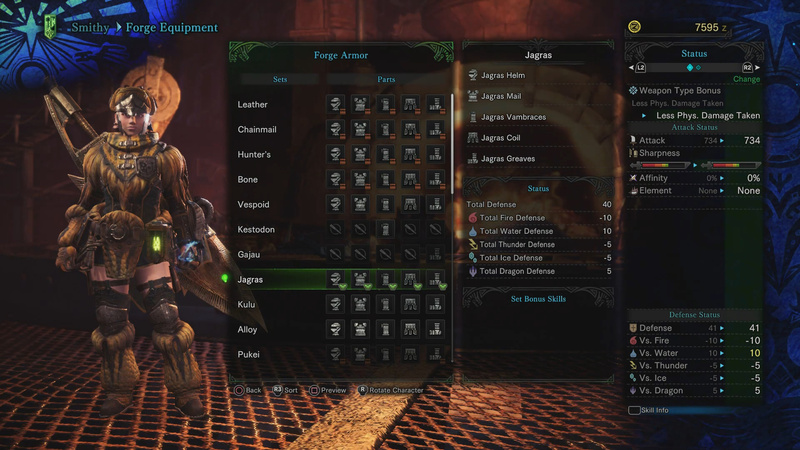 The alpha armor set has an extra skill for your hunter and can be useful if you don't have any good gems. 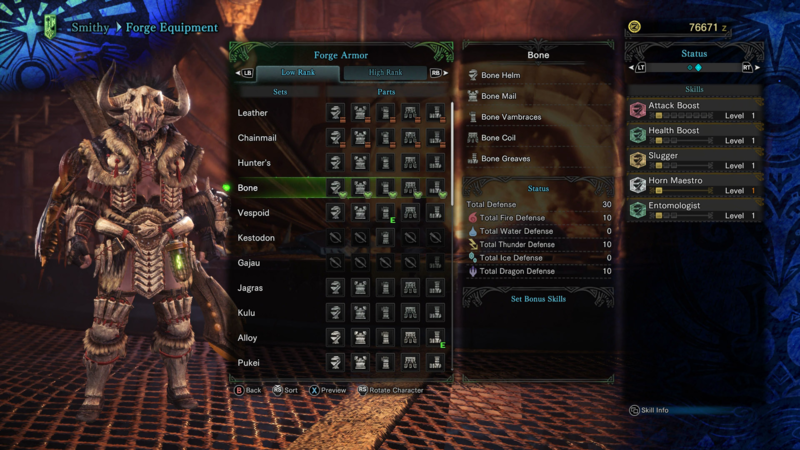 Beta armor, on the other hand, gives you an extra slot for a decoration, which lets you put jewels and other collected abilities into the armor to mix and match. 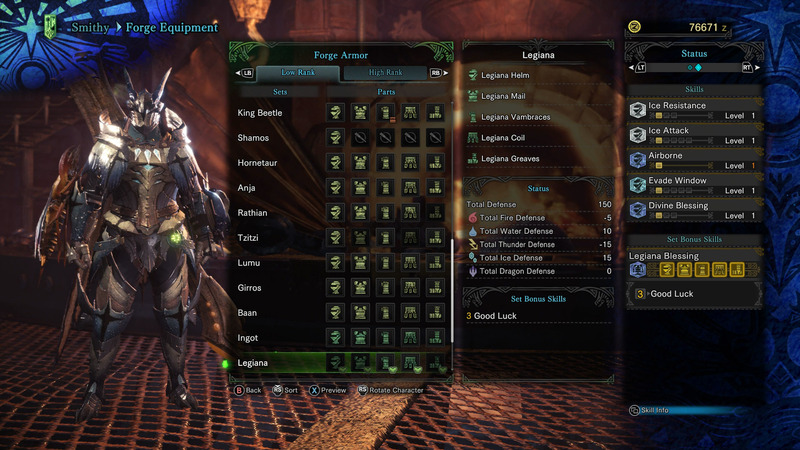 This section combines alpha and beta armor, so it'll be up to you to decide which armor best suits your playstyle in Monster Hunter: World's late game. 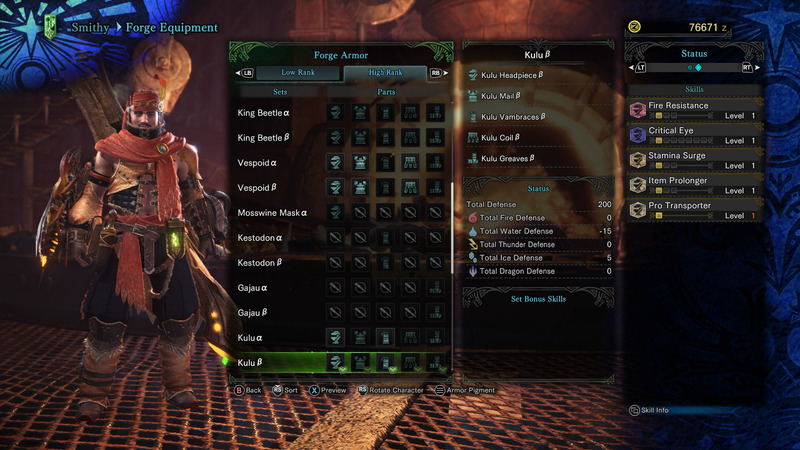 The Kulu set is possibly one of the easiest High Rank armor sets you can get. It's a good armor set to get at the beginning of the story because, once again, you're unlikely to fight against any water elemental monsters. Having a sliver of ice elemental defense is a bonus, but the armor serves as a good starting point when going up against the Pink Rathian. This armor gives you a poison resistance, which is great to have against monsters like the Rathalos and Rathian. It also offers something great for when you're going up against those pesky Elder Dragons—dragon elemental resistance. The fact that it's mainly weak against thunder damage, which is only used by a handful of monsters in the game, is a bonus. The Elder Dragon armor is the ultimate way of showing off in-game. Not only is it insanely difficult to complete an entire set, but they each provide varying abilities and stats that make them the most highly-coveted armor in the game. 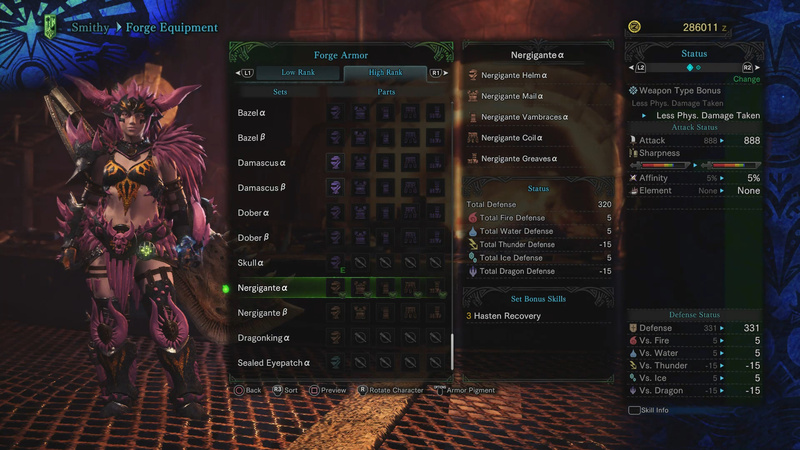 Nergigante's armor, for example, will give you an attack boost when a monster enters a frenzy state. But it can sometimes be hard to craft the head piece due to the rarity of Elder Dragon gems—which is why our next option might be a good alternative. The Dragonking Head armor is one of the highest base defense items in the game. It has no weaknesses and it's definitely worth picking up—if you can afford it.